Even if you’re a company fan, resist the urge to use a trademark in your domain name. The GM Volt electric car is getting quite a bit of buzz lately, including this article in the New York Times. 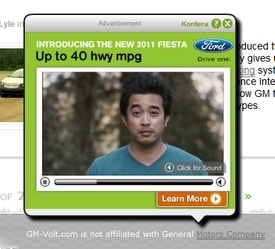 The article links to GM-Volt.com, which it notes is unaffiliated with GM. Compete.com shows that GM-Volt.com gets about 75,000 visits a month, which is nothing to sneeze at. It probably brings in a bit of revenue for the site owner, too, which is why I would never recommend starting a site that uses a brand name like this. GM can quite possibly get the domain name, either through a cheap and fast UDRP or through a lawsuit. Some companies have made a business out of similar car enthusiast sites, including publicly traded Internet Brands. But even they acknowledge there’s some risk in what they do. My advice: go ahead and create a fan site. But don’t include trademarks in your domain name. Under the UDRP and under Federal law, it is permissible for a third party to use a trademark to describe goods and services it sells. This was the holding in the recent case of American-Steinway.com, a site that sold used Steinway pianos and OEXstreet.com, a site that used the trademark of the Chicago Board of Options Exchange (OEX) for a web site providing investor information concerning OEX. Both sites were for profit. This so-called “nominative fair use” is permissible under trademark law, first recognized by the 9th Circuit Court of Appeals. The standard is that the junior user needs the trademark to describe its goods/services; it only uses so much of the mark as is necessary; and it does nothing to create impression of afffiliation with the trademark owner. An additional requirement established under UDRP precedent is that the domain owner does not try to buy every domain variation and prevent the owner from getting a domain reflecting its trademark (which is bad faith under the UDRP). One of the first (if not the first) case recognizing this principle was a 9th Circuit case involving a VW Repair Shop. Volkswagen argued the shop could not use their VW trademark. The court disagreed. As for the GM-volt.com web site, the domain owner must do more to alert the public to the unofficial nature of the site. Not in small print at the bottom, but right on top in bold letters. Othewise, he runs the risk oof confusing users into believing that the site is affilated with GM. From a matter of practicality, if you want users to find you because you sell a particular product, the domain name is obviously helpful to get users to find you. I should have added that another no-no under UDRP precedent is offering ads for competing goods and services. In order to pass UDRP muster, the site owner should remove any such competing ads and make it soley about the Volt. It may be easier to just start your own electric car company, with a strong brand (domain). Somebody should register JPeterman.co and make it a “fan site” for JPeterman.com! By the way, PetermansEye.co is available too! I saw that TommyBahama.co, Hayneedle.co, and Godlikeproductions.co all got snatched up by “investors” too! Love it! I think Toyota just lost a case like that. I think as long as the site is inteded for the trademarked product, it should be fine. But than again, it’s better not to go through that headache. If the site owner gets pushed by GM he can use my domain for free. imo sites like these a company should embrace sites like mentioned in the article . It’s a fan page .. it will do more good then bad ..